Oh, for a respite from the pre-wedding flurry! Need a break? Don’t let stress ruin the romance and thrill of the most special day of your life. Treat yourself to a spa-themed bridal shower with your friends and luxuriate in a few hours, a whole day, or an entire weekend of pampered relaxation. This intimate get-away offers a great way to unwind and de-stress amid the demands of wedding preparations, as you receive the ultimate spa treatment fit for a princess. Emerge from this experience relaxed and refreshed—and at your loveliest for your approaching wedding day. Make It a True “Getaway”! 1. Pick a great spot – It begins with the perfect getaway spot. And the word means what it says…”get away”! So even if all you can spare is a few hours in the privacy of a home (not your own, if possible), make sure those are hours of uninterrupted calm and quiet. 2. Rent a cool place – For even greater benefits, rent or borrow someone’s cozy out-of-town cottage or indulge in a comfy suite in a hotel or resort. Just bring your spa supplies and leave your worries behind. Another growing trend is to request a commercial spa to provide its services at a location of your choice, like your home. 3. Consider spa packages at resorts – For a truly hassle-free approach, explore the growing number of resorts now offering whole-day or weekend spa packages specifically for bridal showers. Or look for actual spas that host spa parties with “the works” for occasions like these. Beyond a conducive venue, it’s the spa-style details that will make this a truly rejuvenating experience. But to make this a true treat for you and your friends, arrange for all the pampering pluses to be provided—from food, to spa treatments, to luxurious touches—for an absolute “do nothing” party. The food – Arrange for a buffet table presenting a light and healthy spread of canapés, spa salads, fresh fruits, and tea sandwiches made with smoked salmon, caviar, and grilled shrimp. Better yet, you can also order a special menu from your favorite gourmet restaurant. The drinks – Offer up a drinks selection of soothing herbal teas such as lemon verbena, orange Ceylon, or Darjeeling, both hot and iced, and refreshing smoothies such as ones infused with chamomile or flavored with peach and ginger. You can also include an array of cocktail drinks such as refreshing mojitos. 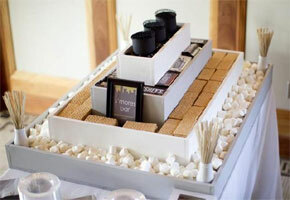 The ultimate treatment – To give guests a true spa day experience, consider having spa stations set up at the venue. These can include a foot spa, a facial treatment, or a luxurious mineral bath just for the hands. For something extra special, you can even hire a masseuse! The special touches – Have the spa venue filled with cool, calming colors like blue and lavender; soft candlelight; relaxing music; soothing scents; and fresh flowers that have calming qualities. Provide bathrobes, slippers, hand towels, sleep masks, and fragrant bath products for guests to feel truly relaxed and away from it all! You may also want to have some magazines and books laid out for guests to read. 1. Choose a relaxing setting where you can take time to rest and relax, and get away from the wedding frenzy. 2. Serve light yet savory foods such as sandwiches, salads, and bite-sized appetizers that everyone will enjoy. 3. Offer guests refreshing drinks with calming flavors and colors. 4. 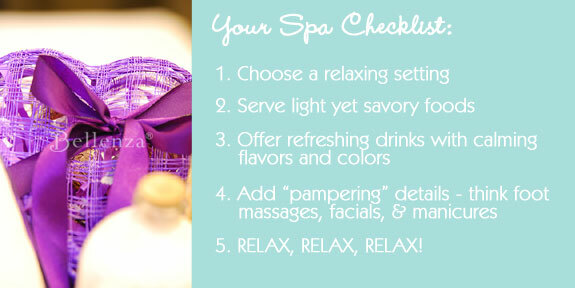 Add “pampering” details that aim to soothe – think foot massages, facials, & manicures. 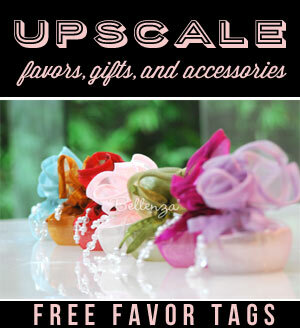 Previous Place Card Presentations, From Fun to Feminine to Fab Ideas! This is such an inspiring idea! I’d love to have this theme for my own bridal shower next spring. I’m thinking of a spa party just for the nails with a manicurist installed at home just for the event. Oh, and for the food, we’re doing an all fruit-shake bar and then when everybody has their nails done, we’re going out for a nice fancy dinner at my favorite seafood restaurant in Santa Barbara! Great ideas! I just dropped by and was wondering if you know of any book for homemade spa treatments. 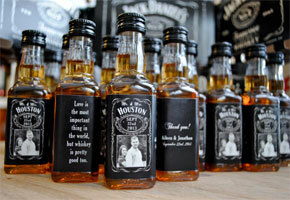 The ideas presented here are really great for somebody wanting to plan a party of their own. Does anyone know of a spa directory? I can’t seem to find a place that lists down spas by city. I am planning a bridal shower for my sister here in Baltimore. There is a great book called “Secrets of the Spas” containing various recipes and ideas. As for a spa directory, you may want to try spaindex.com for information local sources. Happy planning! That’s an interesting book! I checked it out at my local library and saw that it has many recipes. 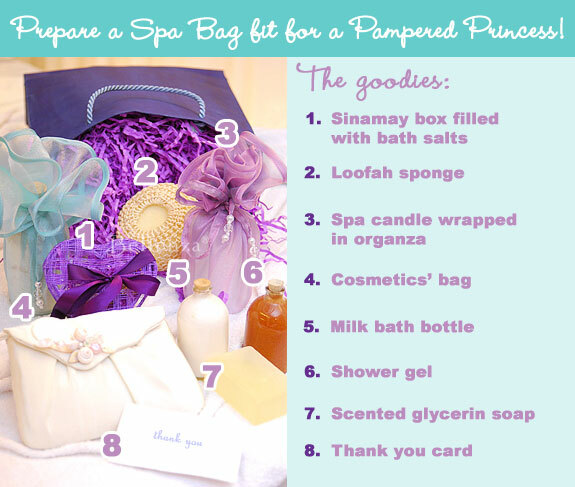 I am planning a princess spa theme for my best friend and the ideas here seem to be pretty easy. We are planning to have a makeover party for her. She used to be an Avon rep so this idea would really be great. I think she will be totally surprised when we do this for her.